WHAT'S NEW Studio Citifi ed XEN LOUNGE IS WELL POSITIONED FOR THE CLOSE-TO-HOLLYWOOD CROWD photos by Steven Andrew Garcia Chef Neil Shuman knows how to twist the classics for XEN Lounge's innova- tive menu. Below: Chef Shuman's take on the clam bake: Little Neck Clams and Prince Edward mussels with housemade sausage, grilled corn and Peewee potatoes. 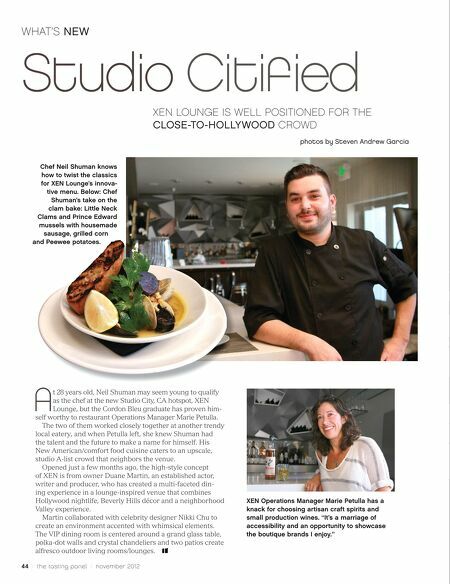 A t 28 years old, Neil Shuman may seem young to qualify as the chef at the new Studio City, CA hotspot, XEN Lounge, but the Cordon Bleu graduate has proven him- self worthy to restaurant Operations Manager Marie Petulla. The two of them worked closely together at another trendy local eatery, and when Petulla left, she knew Shuman had the talent and the future to make a name for himself. His New American/comfort food cuisine caters to an upscale, studio A-list crowd that neighbors the venue. Opened just a few months ago, the high-style concept of XEN is from owner Duane Martin, an established actor, writer and producer, who has created a multi-faceted din- ing experience in a lounge-inspired venue that combines Hollywood nightlife, Beverly Hills décor and a neighborhood Valley experience. Martin collaborated with celebrity designer Nikki Chu to create an environment accented with whimsical elements. The VIP dining room is centered around a grand glass table, polka-dot walls and crystal chandeliers and two patios create alfresco outdoor living rooms/lounges. 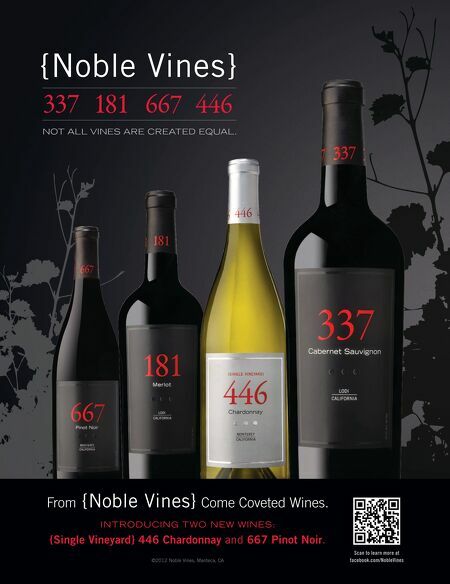 44 / the tasting panel / november 2012 XEN Operations Manager Marie Petulla has a knack for choosing artisan craft spirits and small production wines. "It's a marriage of accessibility and an opportunity to showcase the boutique brands I enjoy."